Bugs in my Hair! tells the hilarious story of a boy who gets head lice. Throughout the text, David Shannon depicts the pesky bugs as if they were humans. One illustration shows the lice lounging on the sofa, eating popcorn, reading a magazine, and watching TV. The book shows how the boy had to be treated to remove the bugs and how his mom had to clean everything to prevent the bugs from continuing to live. He eventually rids himself of the bugs, but they...COME BACK. 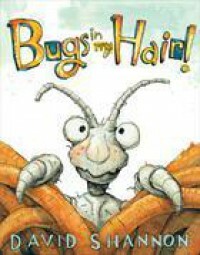 I would like to read this text at the beginning of the school year to introduce students to the topic of head lice and discuss some preventative measures we can all take to keep bugs out of our hair. However, this would be a phenomenal story to use to discuss personification. The bugs in the story are given many human characteristics, so this would be a good text to investigate and identify personification. This text is on a 2.1 AR level.